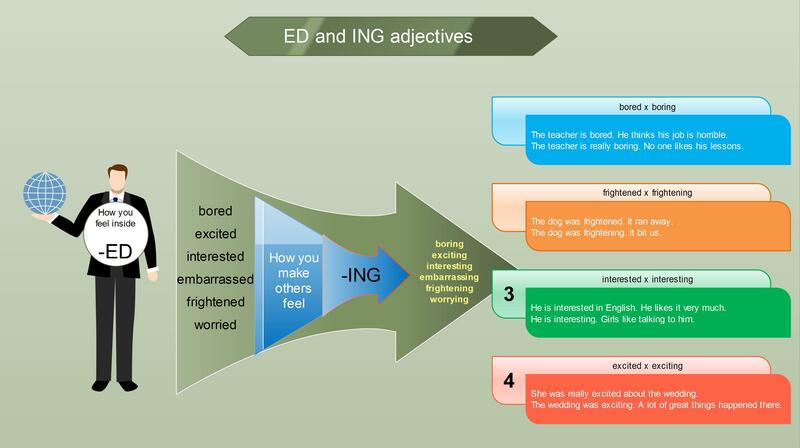 This is quite a simple grammar point – adjectives with the endings ed or ing. The more annoying it is when students use the endings incorrectly. In this post you can find a mind map, two games and a BBC presentation on this topic. I hope it will work fine for you and that you will never ever confuse these two endings again. I call it a mind map but in fact it is a graphical explanation of the grammar point which has nothing to do with a mind map. I have tried to turn the great BBC programme into a video. You can watch the result below. It explains the usage of the grammar. Please sending to me the lessons and the test. well I like the way English is taught here and I m also interested in teaching English to the students of Government school of Nepal and I want to know if there is anyway you can help me make this dream come true. It will really be a life time achievement for me if you can help the students of the government school talk English freely and fearlessly among themselves. I just want to show to the private and costly boarding school and to the parents who think that money can make children smart and learned, that if same opportunity and same educational environment and the same expertise are provided then the ones who come to the government school because weak economic condition can also acquire the same height in learning English. Any help to work to uplift the standard of the English of the students of the government will be highly regarded as a work of humanitarian by me. As for me I have just started to work as sales and marketing officer for Megha publication. thank you. We may design something interesting, with God’s help. Thank you Maria. I will gladly accept any help from any teacher of English. I will certainly contact you. Cool !!! Enjoying it !!! Thanks Maria for your interest and concern. Happy that a teacher showed interest . well ,my email address is hellosohan@hotmail.com and I will be contacting you via this mail id . thanks again for your concern. Thanks a lot for having real zeal to contribute in the aspect of governmental education. please help me .. i want to improve my English language but i do not know , how i can . I am afraid I do not know how to download the game alone. It needs to be embedded into a website, otherwise it does not work. Muy interactivo para aprender mas facilmente y de manera mas divertida.